Prepare cake mix according to package directions. Pour the batter into a greased 15-in. x 10-in. x 1-in. baking pan. Bake at 350° for 20-25 minutes or until a toothpick inserted near the center comes out clean. Cool on a wire rack for 10 minutes; invert cake onto a wire rack to cool completely. 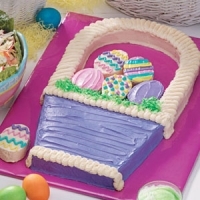 Referring to the diagram below, cut cake into a basket, handle and six eggs. Arrange basket and handle on a 19-in. x 14-in. covered board. Place 1/4 cup of frosting in each of three bowls; tint one pink, one yellow and one blue. Place 1 cup frosting in another bowl; tint purple. Leave the remaining frosting white.